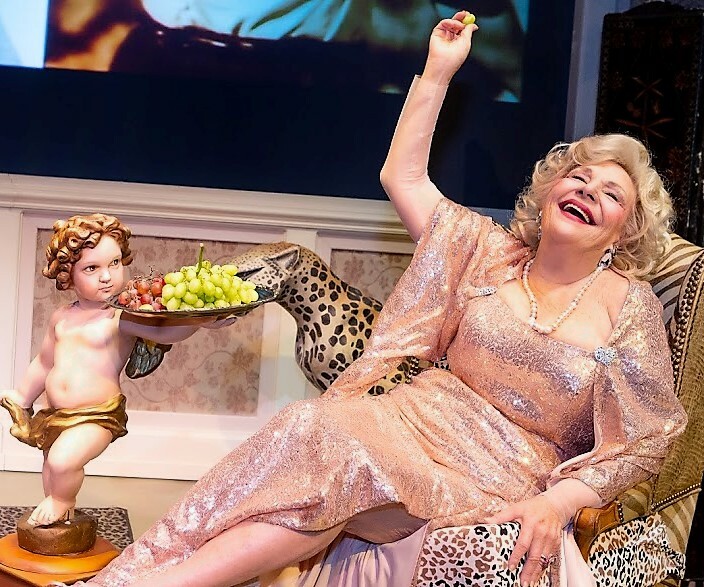 My Life on a Diet, Renée Taylor’s hilarious one-woman show (cowritten and codirected with Joseph Bologna, her late husband), is a testimony to the power of a story and the story teller. In a beautifully beaded champagne evening dress and matching sneakers, she’s the size of a pixie and just as energetic. When she told her doctor she’s going to do a one-woman show, he wonders how, at 86 years old, she’s going to move around the stage for an hour and a half with arthritis, bursitis, sciatica, the beginning of osteoporosis and a broken foot? She tells him “I can jump! I can kick! I can do the mambo!” Then she admits: “In the pool. On dry land, I can walk and I can sit. I just have trouble sitting after I walk and getting up and walking after I sit.” So, she arrives at a happy medium and stays seated for her performance. Renée Taylor, in her one-woman show My Life on A Diet, sits under a photo of her late husband Joseph Bologna. Top: Taylor enjoys a grape per Marilyn Monroe's long ago advice. Photographs by Jeremy Daniel. Born and raised in the Bronx, the Emmy Award–winning Taylor is best known for her role as Fran Drescher’s food-obsessed mother in the 1990s CBS sitcom The Nanny. No laugh track necessary here for this acting pro—her timing is impeccable, and she highlights the absurdity of a life spent chasing faddish diets, punctuating those experiences with moving accounts of her journey through show business since the 1950s. She studied with Lee Strasberg, acted on Broadway, appeared on the Jack Parr Show and in several Hollywood films, and met everyone from Grace Kelly to Marilyn Monroe. Taylor has tried diets both famous and obscure, from the Scarsdale diet to the Okinawa seaweed diet to the champagne diet, which called for two glasses of champagne before every meal. The catch: it had to be expensive. Even though she was making a lot of money at the time, it cost up to $200 a day and would have led her to financial ruin. When she talks about the Scarsdale diet, created by Dr. Herman Tarnower, a cardiologist, that is high in protein and low in carbs and fat and that poses risks to heart health, she notes that his mistress killed him, not in a fit of passion, but because she was desperate to get off the diet. The scenic design by Harry Feiner captures the feeling of a 1970s fashionable den—everything is in either a leopard or a zebra print and accented by faux Ming dynasty vases and small, statuesque cherubs holding little platters of grapes—and complemented by Stefanie Risk's intimate lighting. The grapes are probably a nod to Monroe, whom she met at the Actors Studio. Talking about diets, Monroe told Taylor that she ate a lot of grapes, but the grape diet didn’t work for Taylor either. Taylor tells a memorable story. Taylor's stories about dieting often segue into bittersweet accounts about the beloved famous people she encountered. After dating Lenny Bruce for a while, she was called to testify in one of his profanity trials. But before she had the chance, he overdosed on heroin. The last time she saw Monroe, she knew something was wrong. The bombshell was on her way to see an iridologist, and Taylor tells us that she was wearing an old bathrobe over an old sweater, her jeans were frayed, and her eyes were red. Marilyn asked after Taylor’s love life. “Not too good,” Taylor reported, to which Marilyn responded: “Aw… well, if you do find Mr. Right, let me know if he knows someone nice for me.” Two months later she was dead, and Taylor says that she felt she could have saved her if she had found someone nice for her. That’s when she realized she had to find someone nice for herself. When she visits a psychiatrist, Dr. Bernstein, a Holocaust survivor, she asks, “Why can’t I find a guy I can have a normal, healthy relationship with?” Bernstein retorts: “Vy don’t you try dating a normal healthy guy!” Shortly after, she met Joseph Bologna, a “normal, healthy guy,” whom she began to write comedy with; they fell in love and got married. But first, Taylor, who was in the best shape of her life, threatened to leave him on their honeymoon because she couldn’t stand the pressure of staying thin. “This isn’t me,” she confessed, and told him she’d been faking at being a thin person. He didn’t care and they shared a lifetime—53 years—of laughter, love and comedy writing. Laughter, after all, is the best medicine. My Life on a Diet runs through Sept. 2 at Theatre at St. Clement’s (423 West 46th St. between Ninth and Tenth avenues. Evening performances are Thursday through Saturday at 7 p.m.; matinees are at 2 p.m. Wednesdays and Saturdays and at 3 p.m. Sundays. Tickets are $65 ($75 premium seating) and available online by calling Telecharge at (212) 239-6200 or at mylifeonadietplay.com.